But even with all that sheen and glamour, Apple’s products are as vulnerable to security threats as other devices. So contrary to popular perception, a high amount of malware and ransomware is targeting the Apple device ecosystem right now and you need to actively plug all those gaping holes to protect your devices right now. How to make your Mac Ultra-Secure? The threats don’t end on the names offered in the list above. Modern ransomware is much more sophisticated than you ever thought it was. Just look at how Wannacry, a malignant ransomware, wreaked havoc on Windows system across the globe in 2017! It caused millions of dollars in damages. A built in feature by Apple, the FileVault is used for encrypting your data, which protects against other people getting their hands on your information even if they have it physically. Also make sure that whatever information you backup is encrypted and password protected. 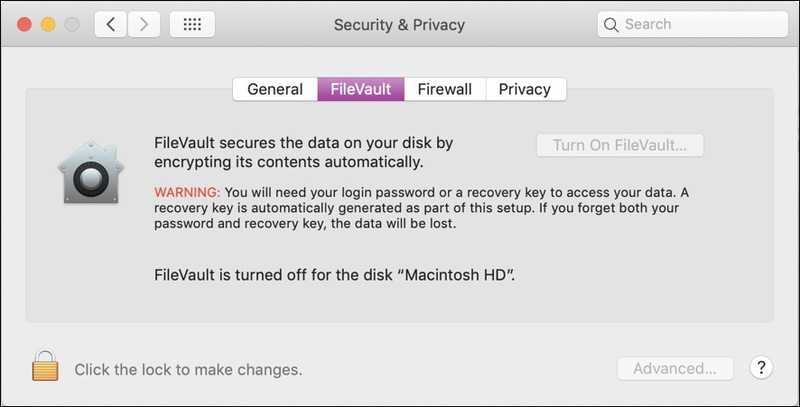 Here is how you can enable this security sandbox: Go to System Preferences > Security & Privacy > FileVault and turn on FileVault. Apple introduced Spotlight Suggestions when it came up with the OS X Yosemite This raised many privacy concerns for several reasons. Firstly data from Spotlight suggestions was being sent to Apple and not only that, it has also sent information to the search engine Bing. Turn off these suggestions by going through these simple steps: Go to System Preferences > Spotlight > Search Results and uncheck Spotlight Suggestions and Allow Spotlight Suggestions in Look up. You can manually setup your DNS settings for your browser such as Google’s public DNS, and add two server addresses to make your system secure. But if that’s too complicated for you or you don’t want to use this method for some reason, you can always opt for third party DNS apps available on the App Store. There are numerous benefits of downloading third party DNS applications. They are faster and offer more features such as add-ons and are updated regularly. Listen! No one wants to know you’re having a piña colada at Joe’s Café. So limit your location sharing immediately! It’s dangerous. Too late? Well, now that the world knows you’re at Joe’s Café enjoying the cool afternoon breeze, it is possible that someone could break into your house or access your connection if you’re using a public Wi-Fi. Technically speaking, other apps may also leech out your location, keeping track of your behavior and selling your data to advertisers. Furthermore, if someone is specifically after you they can track you down and hunt you up! So don’t turn on your location services unless you are in the middle of a threatening situation like being in an Uber ride that’s not following the right route to your destination. Just like you update different applications on your system, for example the Mac’s video player, it’s incumbent to update your systems software as soon as the updates become due. Companies don’t come up with updates just to make your phone or computer feel cool with new icons or to load them up with a half a dozen new features. System updates often bring in better security and protection along with patches for new and existing threats. So the the best way forward here is to use a service like Mojave to setup updates and to download automatically. This way you won’t usually miss out on anything that could have been incredibly important. VPNs are becoming widely popular, even though have existed for a long time. The primary purpose of a VPN is to encrypt your traffic so that even if someone gains access to it, a go-through is not possible, even by a brute force attack.. Another feature of VPN is that it spoofs your IP location so that you cannot be tracked down. Recognizing the need for security, companies have come up with some of the best VPNs for Mac and other platforms so that cyber-freedom prevails and criminals and surveillance bodies stay at bay. Today VPNs have become cheap enough for individuals to afford, and are mostly used to gain access to geo-restricted sites and to maintain anonymity in the online sphere. Bonus Tip: Use Two-Factor Authentication. I know the two factor authentication takes time, but those extra seconds are completely worth it. If a few extra minutes can protect your data much better then why not go for it? This way even if someone gains access to one of your passwords, they won’t be able to get through on any of your accounts where this feature is activated and functioning. Crime has moved to the digital world. As of now, we have our whole lives out on the internet. Every single bit of our important data such as financial details and personal photos are out there, lying unprotected, waiting for someone to pounce on them easily. A little negligence from your side on your system security can result in you being deprived of your money, personal data or other important cyber belongings. So gear up against the uncertainty you face on your Macs as far as their security is concerned and ensure that you fill all the sinkholes through which an intrusion can occur anytime, for a safer and peaceful device usage experience. FWIW, I have ExpressVPN on my mac and it works like a charm. Highly recommend people use a VPN.